We've spoken to various people from id Software during QuakeCon - Todd Hollenshead, Matt Hooper and the mischievous Tim Willits to name three - and there's one question we've asked all of them: Do they ever worry that people have forgotten about id Software? Haven't all these kids grown up playing Halo and Modern Warfare? Nothing in their faces or their answers betrays any concern, but if they were harbouring self-doubt then the fact that more people turned up to see the Rage presentation than John Carmack's keynote address ought to be reassuring - and the fact they left the presentation screaming their support and adulation won't have hurt either. Of course id is on home turf, but it's not hard to understand the fans' appreciation: Rage is being shown on PC, PS3 and Xbox 360 simultaneously, one build each for three gigantic high-definition projections running behind lead designer Willits, who offers a running commentary on the action being played out by three of the game's developers. Platform parity is an oft-professed goal and less frequent achievement, as Eurogamer readers know only too well, and it will take a more forensic examination to determine key distinctions between each version, but to the naked eye the PC version looks the sharpest by a slim margin - something Willits tells us is down to lower compression ratios. Even so, the game's precisely sculpted canyons, rusting industry and slumping cityscapes coarse with crisp, unrepeated textures across all three formats, the products of John Carmack's "megatexture" architecture, while the game's 60 frames per second are as solid as the technology is unfathomable. Rage is another post-apocalyptic shooter - you can never have enough of them, at least not judging by ZeniMax's investment portfolio - but it's perhaps the purest example. Fallout is more about the game world (executive producer Todd Howard calls it the series' main character), while Brink is a manifesto for change in competitive and collaborative multiplayer. Rage is about shooting dudes in the face. Hard. A lot. Willits' colleagues roam through trenches propped up with corrugated iron, switching between meaty shotguns, crossbows that fire electric bolts and sniper pistols using elegant weapon radials, while mission briefings appear as pages in a notebook, gone in a second. Other than that, and the unnerving levels of detail, there's little to disguise the simplicity of the action. 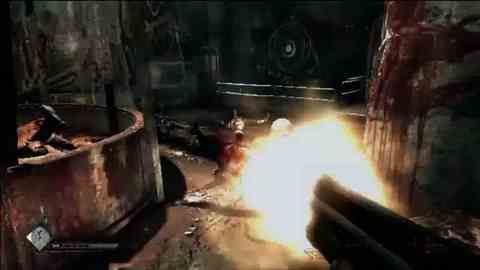 Ghost bandits are reminiscent of BioShock's splicers, vaulting, wall-running and pirouetting toward you to attack with blades and flying kicks; Wasted bandits retreat to cover and direct mounted turrets to suppress you, or swing pipes and wrenches overhead to clout you; mutants shamble and lurch, wielding rudimentary clubs. Shotgun shells snap their heads back, the boomerang "wingstick" clothesline them in midair, and the shoulder-mounted rocket launcher blows them to pieces. Fire, strafe, backpedal, flank.